Three sterling silver inspirational rectangle tags are hung on a "Satellite" ball and link chain. The chains come in 16" and 18" lengths. To order this item, please select a style, then click Add to Shopping Cart button. 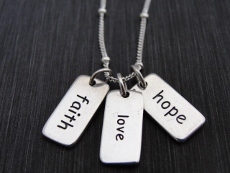 Hip Tip: This necklace can give that special someone, "faith, love, and hope."